Whitcomb and Papillion were once young moon entrepreneurs, but it turned out the market on the moon isn't as booming as they thought! 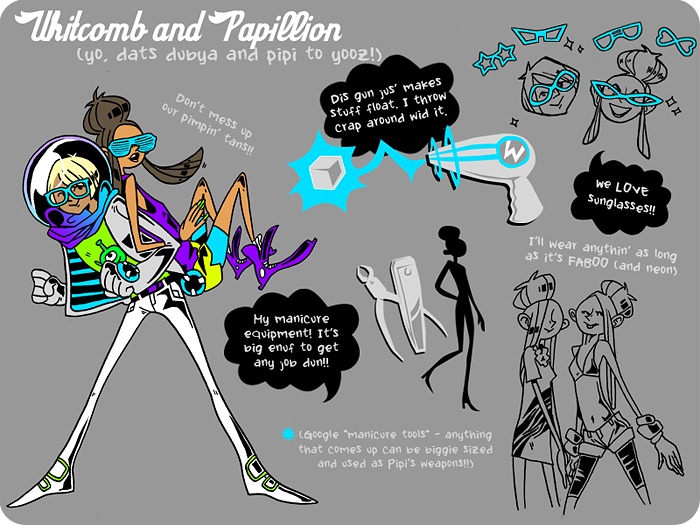 So, they returned to earth to find a place Papillion could operate her manicure business. She has a full arsenal of giant manicure equipment left over from doing nails for moon giants. (You know, moon giants.) Whitcomb is pretty frustrated that his "moon rock catching" didn't lead anywhere, and now just uses his anti-gravity gun to throw things around. "Dubya" and "Pipi" are best friends for life, and are generally always together. They are extremely obnoxious, and talk in fist-pumpin' slang. Their hobbies include their daily beauty ritual (GTL) and partying/drinking like there's no tomorrow.